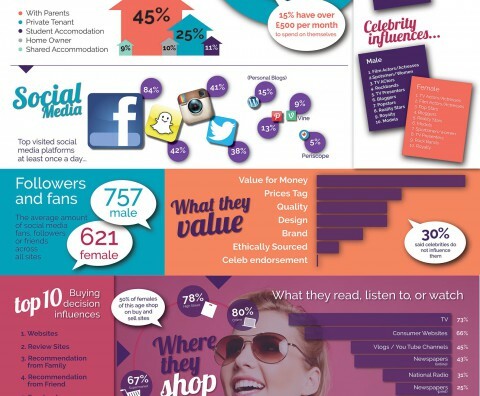 GENERATION Z: The Most Complex Consumer to Challenge Marketers? Marketers and PR folk have long been obsessed with Millennials, those born in the eighties and nineties as supposedly the first generation to adapt to the ‘new age’. However as this market starts to edge into their mid-thirties, there is a new, younger generation paving their way into the world who have grown up completely immersed in the iGeneration, and knows no different; Generation Z. This is also the generation that has grown up in the era of war and terrorism, and holds a more mature appreciate for culture and ethics compared to their predecessors. For marketing professionals this presents an interesting demographic to target, as the way they play almost turns traditional consumer behaviour on its head. Our latest research shows that Generation Z are completely turned off by celebrity culture and traditional media, and are more tuned in to peer to peer recommendation and online superstars like Zoe Sugg, Tanya Burr, Jim Chapman and Alfie Deyes. For female Generation Z-ers, bloggers are actually cited as the fourth most popular “celebrity” influence. For Generation Z, social media is king, but not as maybe you and I know it. Unsurprisingly Facebook, as with most demographics, remains the number one platform, however for Generation Z, Snapchat is the second most popular, with 42% of this audience checking Snapchat at least once a day. For other audiences, Snapchat would barely even appear in the Top 10. With Snapchat increasingly looking to monetise their service, this is a really interesting platform to keep an eye on if you have a product or service that targets this complex group. Where Generation Z are concerned, you can pretty much also assume that print media is dead. This is isn’t to say they don’t pick up the odd magazine or newspaper, however for genuine cut through, online sites, bloggers and vloggers are the media that hold the real power of influence. 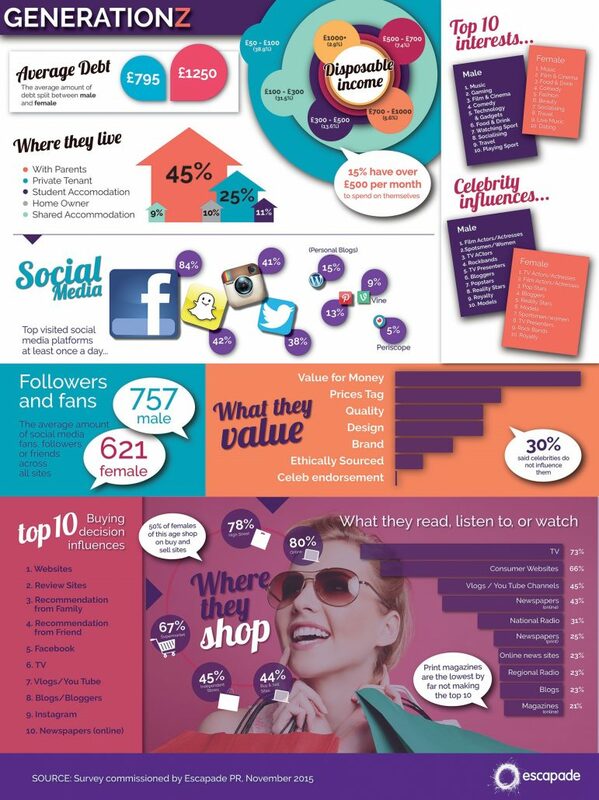 When asked what influenced their buying decisions, no traditional media apart from TV appeared in the top 10. These guys shop around, read review sites and blogs, seek out recommendations and refer constantly to social media. This isn’t an audience to be fobbed off; they are savvy, and seek value for money. For any successful marketing or PR campaign, consumer profiling and understanding how your target audience plays is pivotal. As technology continues to advance at an incredible rate, and what we know from one generation to the next changes rapidly, keeping on the pulse of varying and differing consumer behaviours and applying this knowledge to your creative approach will make all the difference between failure and success. No question. Generation Z are a really interesting demographic, and certainly make for a challenging and exciting audience to engage with. The New York Times describes them as ‘the next big thing for market researchers, cultural observers and trend forecasters’, and Women’s Wear Daily as ‘the next big retail disrupter’. And by no means are we anywhere near understanding this audience fully, as the nature of Generation Z means they are ever developing and evolving in their behaviours. And it certainly makes for an interesting approach when working with clients that operate in this consumer demographic! Visit our PR resources page to download the full infographic detailing the Generation Z research conducted by Escapade PR.